For as long as I can remember, I've wanted to try hair extensions. This is especially true for those times in the past when I decided to cut my hair short. And I'm sure everyone could relate to that moment; hugely regretting snipping off your long, luscious locks. Anyways, even though I don't have short hair right now, I was still excited to finally be trying some extensions. The hair extensions that I'm using were sent to me by Best Hair Store. Pictured above are the 7 Piece Clip-In Hair Extensions* in the colour 1B# which I believe is a natural hair colour. These are made from %100 Virgin Human Hair, so they feel just like my own hair. The style of these are silky straight and the hair is extremely soft. Each clip-in is 18 inches in length and all together they have a weight of 120g. As the name suggests, the set comes with 7 pieces: one piece of 8 inch with 4 clips, two pieces of 6 inch with 3 clips, two pieces of 4 inch with 2 clips, and two pieces of 2 inch with 1 clip. Be Extremely Gentle | When styling and brushing the hair, being gentle can prevent the hair from falling out. It's recommended to use a soft-bristled brush. Brush starting at the bottom and slowly work your way up the hair. Wash With Moisturizing Hair Care Products | Wash the extensions a maximum of 3 times per week with moisturizing hair care products. Since the hair isn't getting natural oils from the scalp to keep it in deep condition, this is needed. Doing this will keep the moisture in from shampooing while at the same time not drying them out from over shampooing. Use a Heat Protectant | Just like regular hair, to reduce the risk of heat damage, use a heat protectant whenever using a heated appliance on the extensions. Deep Condition | Once a week, carefully put your extensions in lukewarm water and apply a bit of conditioner all over. Leave it in for about 20 minutes before rinsing. Avoiding a blow dryer, let them dry naturally. 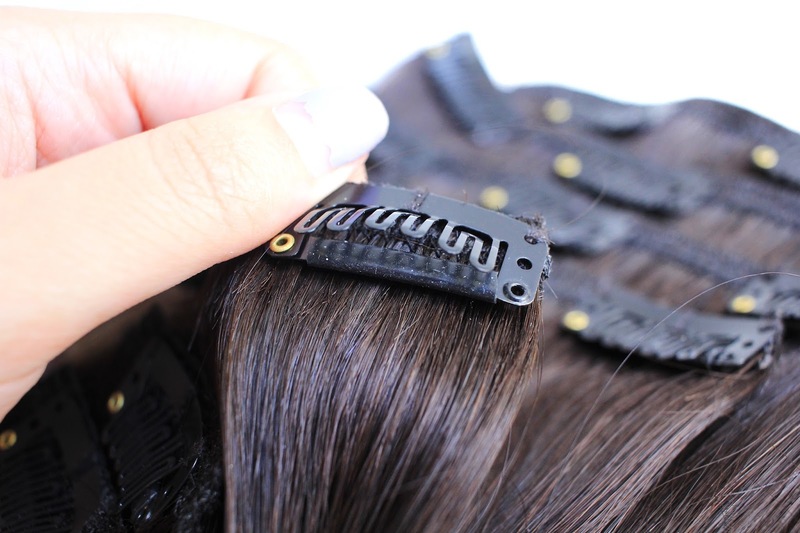 Keep Ends Trimmed | Since these are made of human hair, they are prone to split ends. To avoid letting the damage move up the hair shaft, trim the ends every 6-10 months. With these being the first hair extensions that I've tried, I don't have anything to compare them to. However, I can say that I'm impressed with how extremely soft and natural the hair feels, there is little to no shedding, and the colour is a very good match with my own hair. Also, I want to mention that the clips on these are really good. They clip onto my hair nicely and they don't move whatsoever. As you could see from my before and after photos, the clip in extensions did wonders for my hair. My natural hair is pretty thin and boring, but with the Best Hair Store extensions in, it looks more voluminous and full. Even though I'm a first time wearer, I found it super easy to put these into my hair and blending it in with my real hair was so easy. No tracks were showing (thanks to my boyfriend for checking it out for me!). Overall, I'm super happy with these and so glad that I finally have some extensions to pop in whenever I'm feeling like my hair needs a little boost - or when I fricken cut my hair short again and the regret kicks in.. I never learn. You can find these extensions over at the Best Hair Store website. They have a bunch of other forms of extensions if you're not a fan of clip-ins. Also, a lot of their products are on sale at the moment, so go ahead and check those out! Have you tried extensions before? If not, would you?